What does the name “Bokisch” have to do with Spain? Although Markus was raised in California, he spent his childhood summers in Spain with his family. In the Spanish tradition, he was given wine with water at meals. As he grew older each year the wine & water started turning from a light pink to a deep purple. Little did Markus know, his tastebuds from then on were programmed towards Spanish wines. In 1992, Liz & Markus moved to Spain and worked in the Spanish wine industry in Raimat and the Penedes. 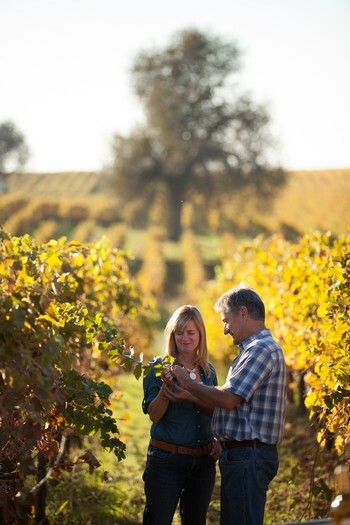 Upon their return, they purchased their Terra Alta Vineyards property in the Clements Hills. Thus began Bokisch Vineyards. Using their Spanish connections they began importing budwood and in 1999 they planted the Las Cerezas Vineyard, known as their “motherblock,” of Tempranillo, Albariño and Graciano. They produced their first vintage of Iberian wines under the Bokisch label in 2001. Now they specialize in 9 different award winning wines which also include Garnacha, Garnacha Blanca, Monastrell, Verdejo and Verdelho. In 2012, we embarked on a new project with our Tizona wines from unique vineyards. The same sense of adventure, just in a whole new direction! Old Vine Zin in 2015, Malbec the next year, and perhaps a sherry or even a cava at some point in the future! Our Bokisch Team is our most valuable asset. Come see us at one of our events, we love getting to know our customers! Many of our wines have been recognized by wine competitions or wine critics, you can see some of the latest awards and accolades.